Who is to blame for top trust failing? A former head of the civil service announces his departure as chairman of a major London hospital and attacks the government's handling of the NHS. Regulators say the hospital has the worst financial performance in the service and is heading for special measures. They are different sides of the same story in the latest twist to the long-running tale of the politics of the NHS in England. So was Lord Kerslake resigning on a point of principle because of underfunding of the NHS? Or was he jumping before he was pushed by regulators? In a funny sort of way, both could be true. NHS Improvement were ready to take issue with Lord Kerslake only a few hours after he surprisingly announced on Sunday he was quitting King's College Hospital via a statement to the Guardian and comments on Twitter. He added that the government and the regulator were unrealistic about the challenges facing the trust and the NHS. A spokesman for the regulator, NHS Improvement (NHSI), said the financial performance of King's was "unacceptable" and still deteriorating. Putting the hospital into financial special measures was being considered. But by Monday lunchtime the decision was made and King's was in special measures, with a spokesman saying it was not acceptable for individual organisations to run up such significant deficits. A budget deficit of £38m for 2017-18 had been agreed with the King's board. This had jumped to £70m by October and then £92m last week. Lengthy discussions between NHSI and King's management reached a head last Friday. Its understood Baroness Harding, who chairs NHSI, met Lord Kerslake. He was left in no doubt that the regulator was frustrated with the lack of progress on the finances and that special measures were being seriously considered. Its understood Lord Kerslake was also warned that this might affect his own position - but no formal order to quit was issued. There was no suggestion that NHSI was ready to hit the button on special measures on Monday. Lord Kerslake seemingly considered his options over the weekend. He may well have been aware that his trust was set to come under attack from the former chief executive of NHSI Jim Mackey. In an interview with Health Service Journal due out on Monday, Mr Mackey said he was frustrated with King's because it "hasn't hit a single number that they've put to us in the two years I've been involved in NHSI". Those numbers, he said, were "huge". Lord Kerslake made his decision to go and revealed it on Sunday, telling the Guardian there were fundamental problems with the way the NHS was funded and "we desperately need a fundamental rethink". The following morning, he told BBC Radio 4's Today programme that he was deeply concerned about all of London's hospitals and the number that were struggling. Whitehall sources meanwhile were drawing attention to the financial plight of the hospital and the likelihood of regulatory intervention. NHSI did not wait long to formally invoke special measures at King's. Senior figures at King's have been paying tribute to Lord Kerslake. They acknowledge mistakes in financial management including the setting of a budget for this year that was too optimistic. They point to the takeover in 2013 of Princess Royal University Hospital (PRUH) in Bromley, which had imposed a bigger financial burden than anticipated. Performance in patient care, they argue, had improved at PRUH but this had come at a cost. The Council of Governors at King's, representing community interests, is understood to be worried about the special measures regime. The lead governor, Chris North, told the BBC they trusted Lord Kerslake and were "concerned at further cost pressure and the need to source further reductions after two years of major cuts". NHS Improvement will now put officials into the hospital to help financial management. King's may have created some of its own problems, and Lord Kerslake will have to take his share of responsibility. But his comments on the wider difficulties for the NHS have rung true amongst most leaders in the health system. 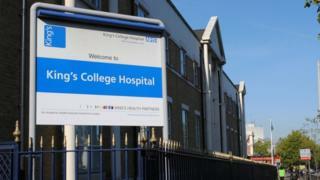 King's now joins Bart's Health (including Royal London) in special measures. Both were widely praised for their response to the London terror attacks and the rapid response of staff called in as part of emergency plans. They are world-renowned hospitals with high-class staff, but regulators clearly feel they are in need of financial first aid.